Posted by bobdillon33@gmail.com in Brexit. European Union, Forthcoming Brexit Negotiations. It’s hard to shed a tear as Britain formally triggers the doleful negotiations to exclude itself from the mainstream of European politics and economics. In this post I am interested in exploring the Hidden aspects of ‘Brexit’ and the Hidden Costs of the FORTHCOMING negotiations. Even an amicable deal risks major legal hurdles. Any exit deal struck outside Article 50 would risk legal challenge before the EU courts. What is more, any treaty changes would trigger a referendum in other EU countries, which could either stop the process dead and/or infuriate those on the other side of the table. The UK has a long history in which it abused its relative power over other populations. So as we now watch the inevitable turmoil which will follow UK withdrawal from the EU it would be wise to remember that according to constitutional practice in the United Kingdom, Parliament has no formal role in treaty-making, as the power to do so is vested in the executive, acting on behalf of the Crown. However Treaties with direct financial implications require the assent of Parliament because they affect revenue. ( The most common type are bilateral agreements to avoid double taxation. The texts are laid in the form of draft Orders in Council and are occasionally debated.  Many treaties require a change to domestic legislation which will be subject to the usual parliamentary procedures.  Treaties which stipulate Parliamentary approval – where an agreement is of a political nature and is known to be controversial, one or both of the governments involved may wish to safeguard its position by writing an express requirement for parliamentary approval into the text.  Other treaties and international agreements may be subject to some degree of parliamentary scrutiny if a Member raises the issue through a Parliamentary Question or early Day Motion, for example. The UK has over 14,000 treaties. The Vienna Convention on the Law of Treaties (in force since 1980) defines a treaty as: ‘an international agreement concluded between States in written form and governed by international law, whether embodied in a single instrument or in two or more related instruments and whatever its particular designation’ Only a minority of such agreements have “treaty” in their title. Other common names include “convention”, “protocol” and “agreement”. As we all know looking back on history treaties are not worth the paper they are written on. For example : The Treaty of Waitangi, New Zealand’s founding document, was meant to be a partnership between Māori and the British Crown. Although it was intended to create unity, different understandings of the treaty, and breaches of it, are still causing conflict. Hitler’s had said in (1924) that he would abolish the Treaty of Versailles. It can be argued that it was not just Hitler who broke the Treaty of Versailles, but also Britain and France, when they allowed him to do what he did. Britain has not been as insular an island as some people take it to be. Separated by just 20 miles (33 kilometers) of water at the Strait of Dover its reigning royal family (which is German) to its exports (overwhelmingly to Europe), have both shaped and been shaped by developments in the rest of Western Europe. England joined the European Union through the Royal Prerogative, and will negotiate and leave the European Union through the same. So what is the Royal Prerogative ? The prerogative appears to be historically and as a matter of fact nothing else than the residue of discretionary or arbitrary authority which at any given time is legally left in the hands of the crown. The prerogative is the name of the remaining portion of the Crown’s original authority … Every act which the executive government can lawfully do without the authority of an Act of Parliament is done in virtue of the prerogative. By the word prerogative we usually understand that special pre-eminence which the King hath, over and above all other persons, and out of the ordinary course of common law, in right of his regal dignity … it can only be applied to those rights and capacities which the King enjoys alone, in contradiction to others, and not to those which he enjoys in common with any of his subjects. Hopeful and aspirational international declarations of human rights have led progressively towards the adoption and implementation of more robust and justiciable instruments for the protection of fundamental rights in the domestic sphere. Amid political, social, legal and economic crisis, – this narrative is dying. UK (a day after invoking Article 50, setting Brexit negotiations in motion), is now proposing to using powers dating back to Henry VIII. to convert European laws into domestic legislation without any parliamentary scrutiny. The fact that the UK unwritten magna carta constitution allowed these sorts of powers to survive is “a wondrous thing” as he was all about essentially dictatorial powers. The scope, and the definition of these powers and when they can be used, in what circumstances, is a black hole of the future of the UK and can only be viewed as a power grab by Mother Theresa. This is not only undemocratic, but may well lead to the loss of individual rights. In the current climate, it is perhaps more than the ghost of Henry VIII that will haunt them. EU law still applies in the U.K pending an exit. The right to complain to, or seek a decision from, EU institutions will be beheaded by Brexit. The EU’s court system could be similarly cut off by Brexit, relying on the domestic judicial system and common law and ECHR rights. The U.K. courts would face a constitutional crisis. Judges would have, on the one hand, the 1972 Act telling them to apply EU law and, on the other, legislation restricting it. A fundamental tenet of EU treaty law is that it trumps all national law. There will be a “constitutional conflict [that] would antagonize and politicize the judiciary on both sides. Governments of Scotland and Wales and NI could also raise constitutional concerns. EU citizens could sue the U.K. government for compensation if they suffer damages as a result of conduct contrary to EU law. All of this points to the need for absolute transparence in the forthcoming negotiations. This is not a war in the true sense of endangering lives, but as Brexit becomes more of a reality, the UK’s financial services sector will be the foot soldiers in a financial war over costs, tariffs, stock exchanges, and the European bond marketplace. Money wars always turn ugly quickly. It could easily sour the rest of the Brexit talks process, and the “new relationship” process to follow. You can see how the politics of this could get toxic quite quickly. Britain’s exit bill is a potential slaughterhouse for the idea of a smooth and orderly negotiated settlement. Britain as a full member state has agreed to current EU budget, so the European Commission expects it to honour its commitments and pay up its share – somewhere in the region of €29 – €36 billion. Getting a deal done is a political tight-rope walk, with one major sensitivity being the issue of where the combined Agencies will be based. The European Medicines Agency, which, like the Food and Drug Administration, oversees the approval of drugs for use across Europe, is a European Union agency, so it will almost certainly have to leave Britain. Drug companies might require two authorizations for new products — one British, one European — pushing up the prices of medicine. The European Banking Authority will also have to re locate. Brexit will jeopardize the creation of a single European capital market. THEN WE HAVE 45, European Union agencies, or similar bodies, and they are considered trophies for member countries because they bring both prestige and economic benefits – WITH THEIR PENSIONS. The British will argue that their obligation stops the day they leave the EU, or might continue with pension payments for the British staff of the Commission (about 4% of staff) – this would cost about €80m this year. And there is a whole stack of off-balance sheet items. It will add tens of millions to Ireland’s annual legal costs and severely limit the government’s ability to protect the country’s interests in EU legislation. Michel Barnier’s EU negotiating team will argue they have an ongoing commitment to pay, because they gave a commitment as a member state to cover the retirement cost of all staff hired, and must pay the UK share of that cost – between 12 and 15% – giving a cost this year of around €120m. But the pension funding commitment won’t peak until 2049, when it will hit €218m for the UK share. There are also a stack of other liabilities – such as the €16 billion Juncker fund for economic stimulus, or the €3 billion Galileo satellite navigation system, €10 billion for the Connecting Europe fund. And there are contingent liabilities and guarantees on loans made to the European Investment bank (€23 billion), and the various EU bailout schemes, which amount to €56 billion. The UK has a share of some of the guarantees that allow this money to be borrowed at low rates (adding its heft to the ratings agencies’ AAA rating for EU debt). But just as the EU has liabilities, it also has assets on its balance sheet, and the UK would be due a share of these to offset the exit bill. These include €8.6 billion of property, plant and equipment – including the Commission’s Berlaymont Building in Brussels, and the Galileo satellites – and €13.9 billion of assets available for sale. The UK is also due a share of EU spending over the next few years, so about €9 billion is netted off the final figure for that. And there is some of Mrs Thatcher’s famous budget rebate due to the UK as well. So that has to come off to arrive at a net figure for the British bill. A key point of contention is what is the British share of the EU budget – is it calculated from Gross National Income (GNI) in which case Britain has to pay up 15% of the overall EU bill. Or is it calculated (as the British would prefer) from an average of actual contributions after the rebate – in which case it is 12.1%. If the UK share of the bills is set at 12% they would have to pay €57.4 billion. At 15% share, the cost to the UK would be €72.8 billion. The exit costs will be settled by politics, not law. That’s how pretty much all EU money fights end – by a political compromise. The entire system is set up to produce political compromises. Yes the EU could simply refuse to budge and run down the two-year Article 50 clock to extract concessions from the British. 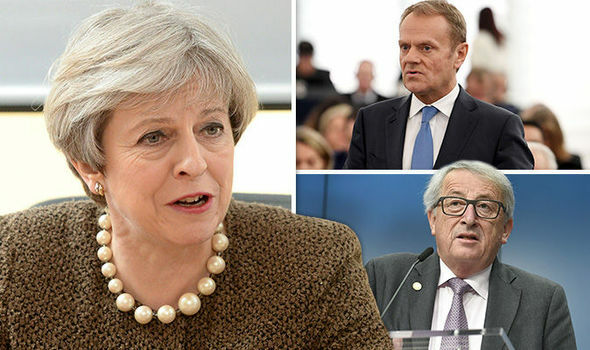 But the danger is if the talks with Britain collapse completely there is no deal of any sort – on trade as much as the terms of departure – and the EU states are left to fight among themselves over filling a €60 billion budget hole, or cutting aid to the most needy states (who are already enjoying less generous terms than we got when we were net beneficiaries of the EU budget ). With pressure on both sides to do a deal, how the departure payment issue is dealt with will set the tone for most of the other negotiations over the terms of Brexit. The effects will be more far-reaching than anyone imagined. TO GET ALL OF THIS DONE IN TWO YEARS IS FARCICAL. HOWEVER YOU CAN REST ASSURED IF ANY OF IT IS DONE BY BACK DOOR DEALS WE WILL NOT BE SAYING GOODBYE TO ENGLAND BUT TO THE EU.